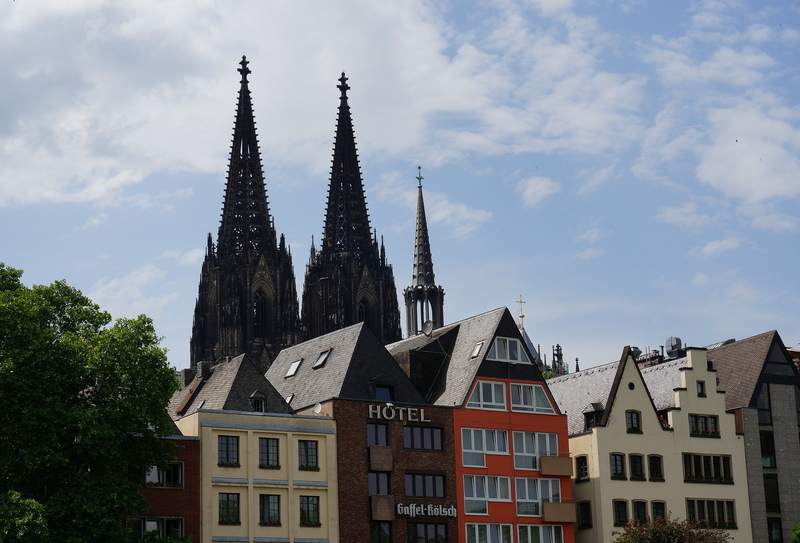 It was late afternoon, and I had just spent the day walking in Cologne’s Altstadt, taking photos and doing a little window shopping. But now my feet were tired and I was getting hungry. What I had in mind was a quiet, sit-down meal at a restaurant I had read about online. Making my way there, I took a wrong turn and found myself at the HeuMarkt, a lively open square where crowds of people were gathered. As it turned out, Cologne Wine Week was happening and I had just walked into the middle of it! Koln Wein Woche takes place each May and brings together local and family-run wineries from the Rhine and Moselle Valleys in one place for a week-long celebration of wine. It’s a great opportunity to sample dozens of Rieslings and other great local wines, all in one place. You can purchase wine by the taste, glass, or bottle and grab a spot at a communal table to enjoy! To go with your wine try a simple cheese plate or treat yourself to some hearty fare, like grilled sausages, frikandel, and potato pancakes. Germany’s Rieslings are well-known, but with 26 wineries to choose from, I decided to try something new. I chose a delicious Grauer Burgunder (Pinot Gris) from Weingut Haus Thiel, which paired really well with my applesauce-topped potato pancake! Sometimes taking a wrong turn can lead you in the right direction after all. Krakauer mit brod – like a hot dog, only better!